​Finding it hard to dispatch the right worker to the right place at the right time? Synchroteam makes it as easy as dragging and dropping a job onto a worker based on his availability, competencies and location. ​Field service management is a time-consuming job, but Synchroteam eases the process and helps businesses in many industries efficiently manage their mobile workers, simplify their processes and optimise their costs. It is a complete and intuitive Field Service Management solution with Scheduling, Dispatching, Tracking and Reporting capabilities. Planning job assignments and dispatching them can be a nightmare, but it shouldn't be. 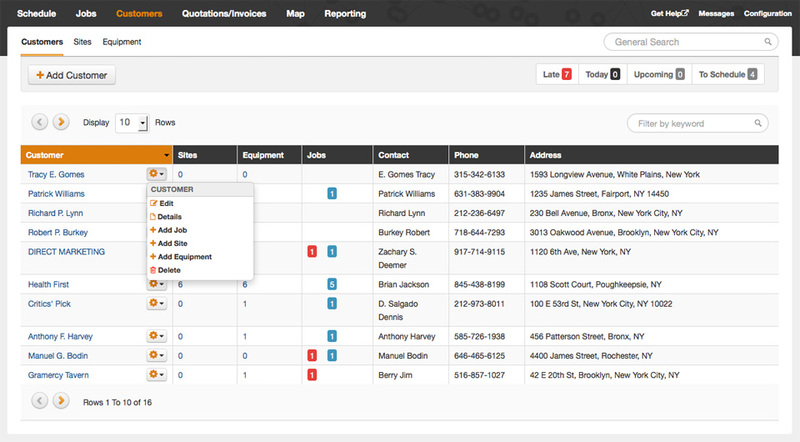 With a complete view of any day's operations, you can instantly see who is booked, when and for how long. 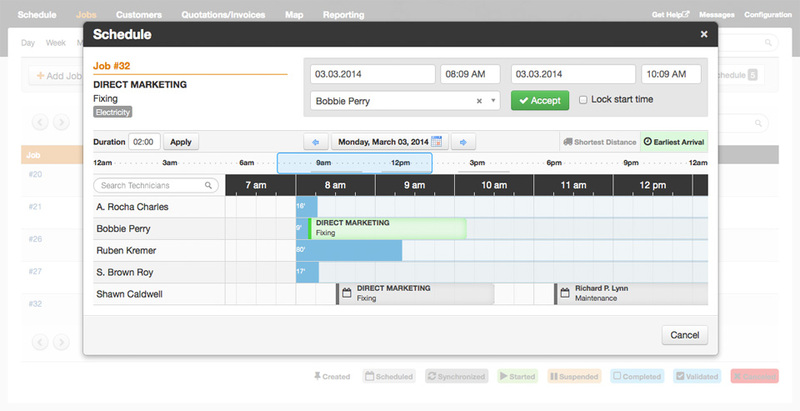 With resize, drag and drop capability, it only takes a few seconds to schedule and assign jobs. You can even re-assign jobs or change their duration by dragging them over to a different technician, and stretching them to match the correct duration. You and your technicians see the same information at all times - it is continually updated. Synchroteam's smart refresh technology lets you know as soon as a change occurs and updates the display accordingly. There are many, many variables that you need to take into account when scheduling jobs: When/Where are other jobs scheduled? Who's closest? Does the technician have the skills required? 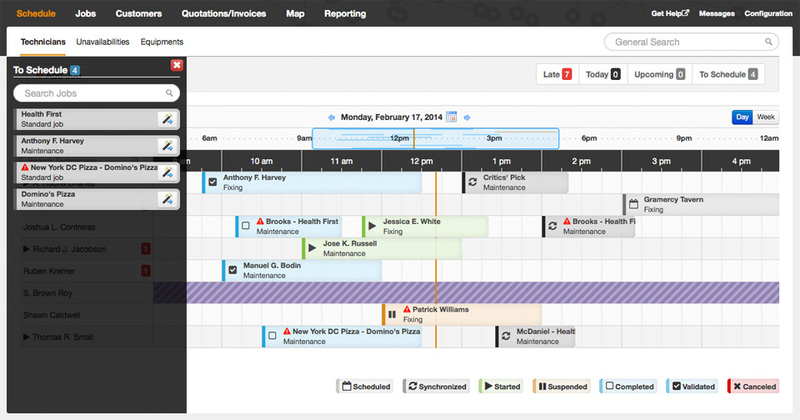 ScheduleAssist takes all these things into account to suggest the best schedule. You can define required skills for your job types, and define the same skills for your technicians. This helps scheduleAssist suggest time slots for qualified personnel. 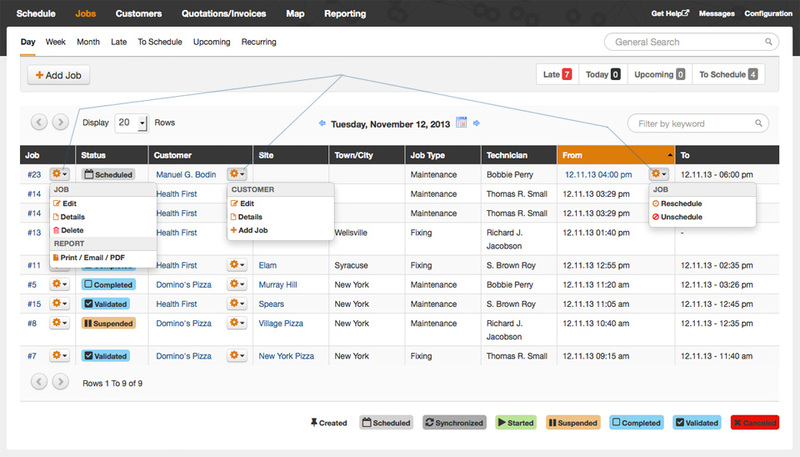 Keeping your jobs database well organized is key to efficient scheduling and job management. Rather than provide a single screen with a long list of jobs, Synchroteam separates them into 'buckets' that correspond to their current status: Today's jobs, late, upcoming, recurring and jobs that still need to be scheduled. 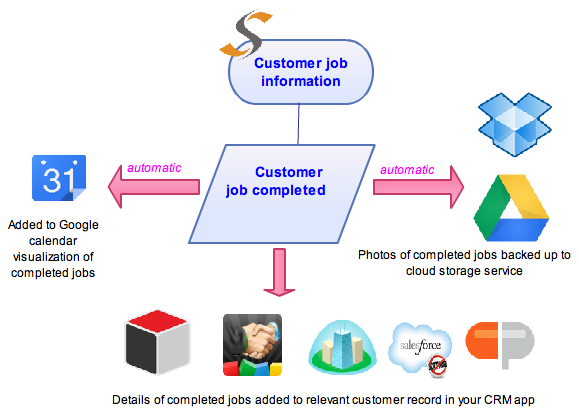 To keep things familiar, the Synchroteam customer database follows that same interface and format as the jobs database. 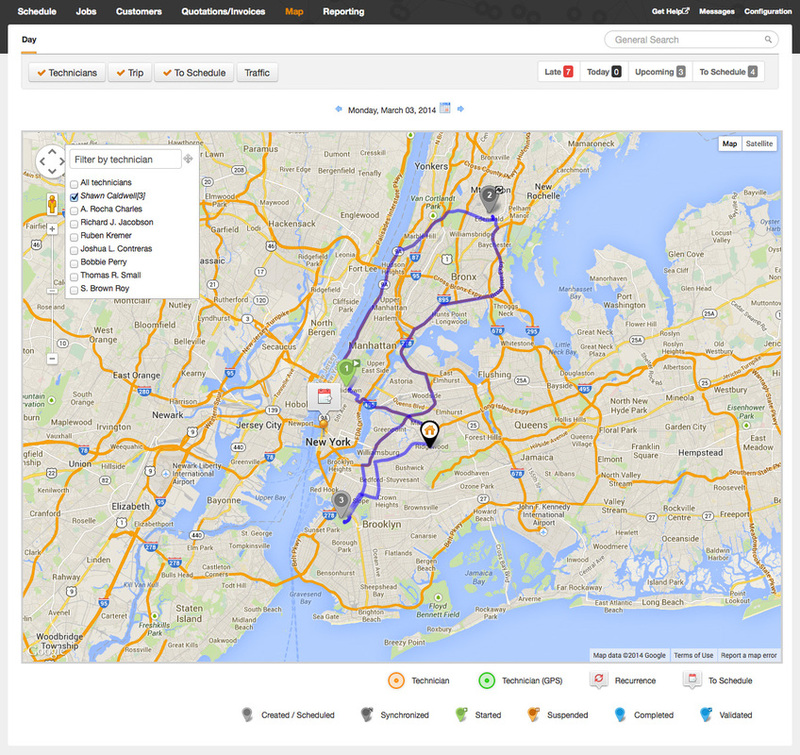 ​Knowing your mobile staff's location and planned routes in real time is vital information. Time and time again, businesses like yours need to deal with customer emergencies that require decisive and swift action - But how are you supposed to send someone to sort out a crisis quickly when you don't know where everyone is? The Synchroteam map view provides you with a very quick answer. 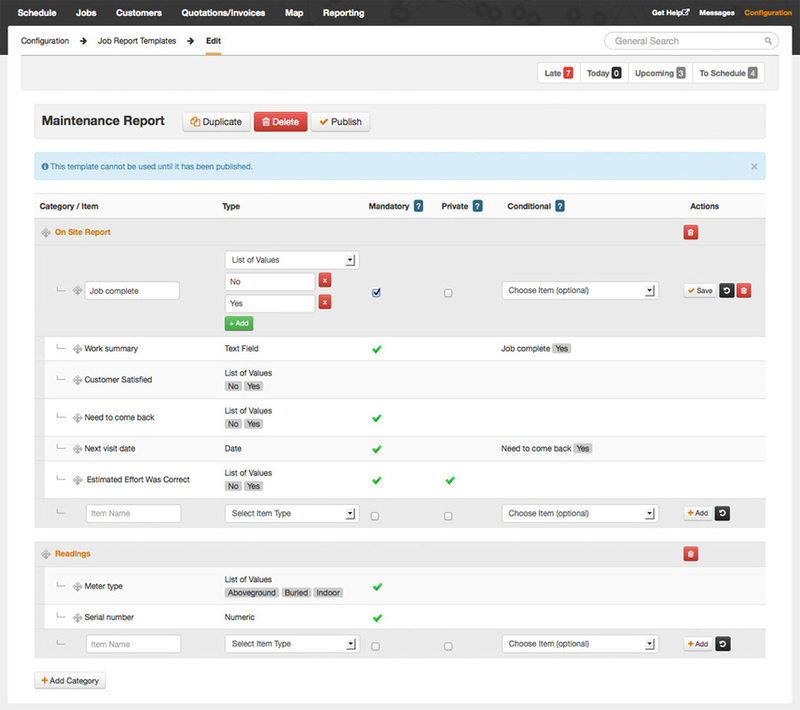 Synchroteam gives you enterprise class job reporting functionality. Every organisation has different ways in which it wants technicians to report on work completed. That is why Synchroteam provides you with a fully customisable job reporting facility. You can have 2 job report templates or you can have 257. But which ever you chose, every report will have all the data you need to evaluate and understand your business operations. Create your invoice from the information collected in the field. ​Synchroteam collects all the information needed to build estimates and invoices, direct from your technicians in the field. All this data is available immediately and can be converted into quotations or invoices that can be sent directly to customers, or synchronised with third party applications. You are also free to edit or create line items in the invoice or quote as required. Every business is unique, so Synchroteam provides a wealth of configuration options. In fact, the list of settings has grown over the years, as customers requested that more and more things be configurable. Synchroteam offers a steadily growing catalogue of robust, pre-built integrations to connect Synchroteam with the most important Cloud business apps. Now your business apps can work harder and better. No development skills required. Already run your own data infrastructure? Synchroteam provides a complete suite of web services so you can integrate with your existing information systems (CRM, ERP, Web site, etc). 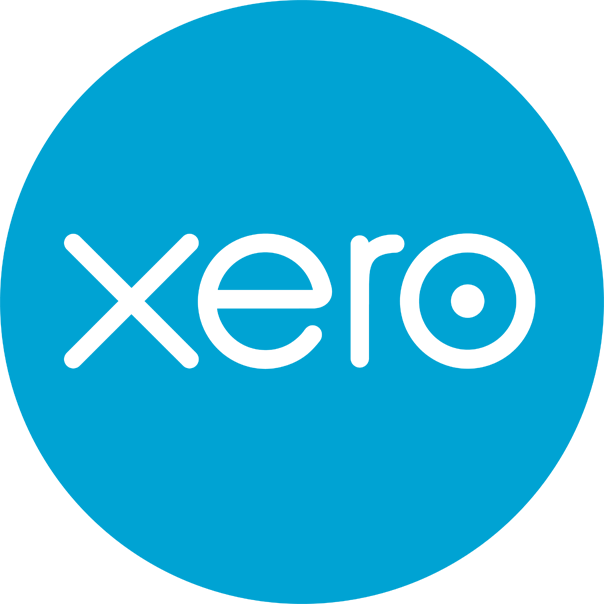 Add Xero's beautiful accounting solution to Synchroteam and get a complete business solution – All Field work integrates seamlessly with a best of breed invoicing solution. Invoicing: Turns jobs in Synchroteam into Invoices in Xero. Connect your mobile workers with the Synchroteam iOS or Android app. The Mobile App is a key component of the Synchroteam solution. It's like a mobile control centre, giving your mobile workers all the information they need to work efficiently, and communicate with you in real time. ​The Synchroteam clients use an onboard Enterprise database and remain fully functional whatever the quality of your network coverage: data encryption and transactional integrity is maintained even when your network connection is lost. ​Dealing with work orders has never been this intuitive. 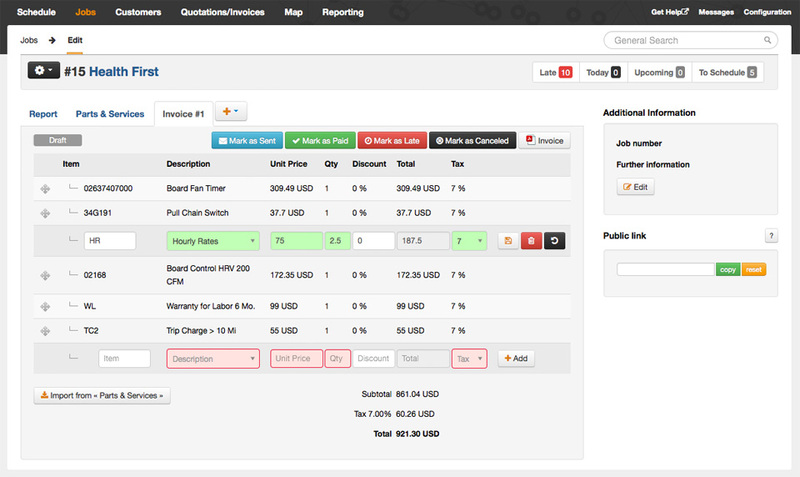 Job updates are provided in real time, and displayed in a logical order: today, upcoming, late and completed. ​Review previous work orders. Create, Reschedule or Decline jobs. Access attachments associated to a Job or Customer. Activate/Deactivate Autosync and GPS tracking. ​Review work order information before starting the job, and take advantage of interactive assistance features, such as: instant driving directions, one-touch contact calling, job description and report review. ​Synchroteam's interactive Job Reports are tailored to request only required information and automatically record time milestones. Capture signatures, photos, barcodes and parts/services usage. ​Receive notifications for new jobs, scheduled jobs or rescheduled jobs on your mobile terminal. 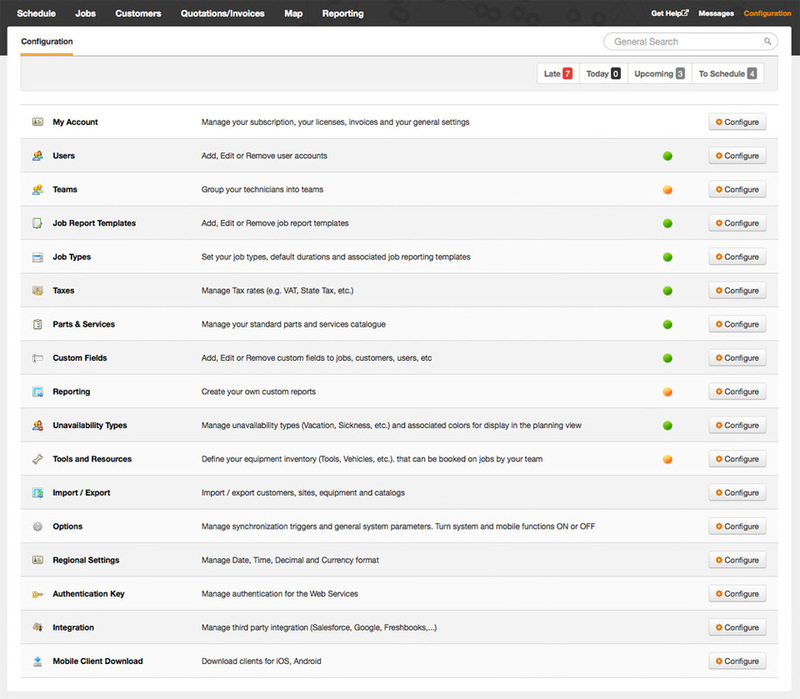 Notification settings are fully configurable. * Per user login: administrator, job manager, mobile worker. ​ For mobile workers, the license includes access from one device.